The rich red and green colours of New Zealand’s pohutakawa and rata trees are an iconic part of the kiwi summer and holiday season, but our native “Christmas trees” are facing various threats, including the insatiable appetite of introduced possums. In April, a group of Pohangina Valley residents, DOC staff, and rata experts, began a seed collecting expedition to help preserve the local populations of Northern rata. 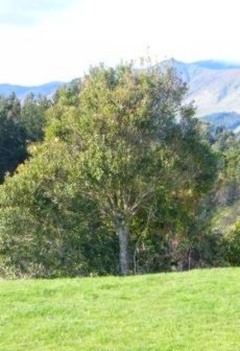 A rata tree opposite the Pohangina Base, belonging to a local farmer, had been seen flowering in the previous year and was the perfect candidate to start the expedition. We simply had to phone the farmer with a request to collect seed and then stand on the cliff edge and pick bunches of mature seed capsules. The second source of seed came from massive rata trees along the Kahikatea Walk. The logistics necessitated collection using a different method – in this case spreading matting over the soil surface at the base of the trees and collecting seed as they fell over the coming months. Rata experts Chris Thomasen and Viv McGlynn demonstrated how to prepare the collected seed for germination. Containers were half filled with potting seed mix, followed by a layer of ‘duff’ – a name given to the nutrient rich soil that builds up at the base of rata trees. The rata seed were then thickly sprinkled over the top. Watering needed to be gentle but regular, using a fine mist, as the seed can be prone to pathogens. The team came together again in November to carefully transfer the thirty odd small seedlings to individual planter bags where they will grow on for another season. The ultimate aim is to grow plentiful rata plants from locally sourced seed, thereby ensuring it is genetically suitable for using at various sites in the Pohangina Valley. The vision is of a corridor of red flowering rata trees in summer, leading up the valley and into the Ruahines. Interested in protecting the native pohutukawa and rata trees in your area? Find out about the work that is being done by the Project Crimson Trust on the DOC website.